The color-rich transitions from sandy edge to breaking surf to deep water provided the guiding idea for this project. Working with Mauricio del Valle in Miami on the architecture and exterior balcony elements and with G2J Design on the lighting, FORMWORK designed this forty-first story apartment to mirror the qualities of its site. As the cool, serene blues of the open ocean give way to the visual cacophony of the city, so to do the interior spaces adjust from cool and open oceanside, to a brightly colored, increased density facing Miami. 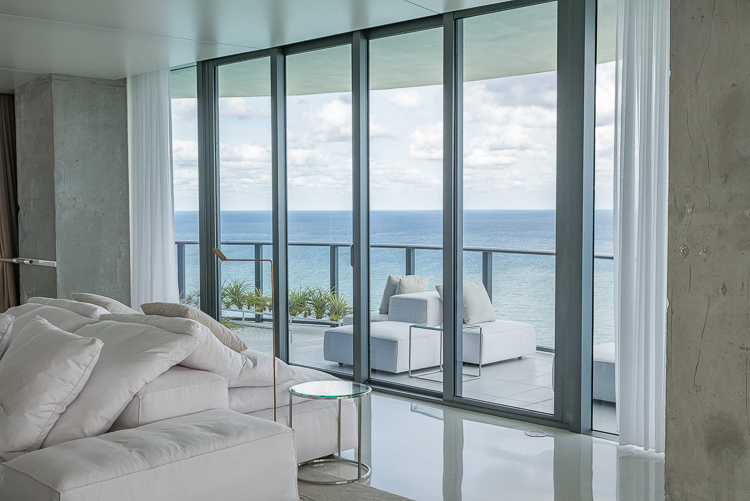 The existing room partitions on the east side of the apartment were removed to make an uninterrupted room in the east with clear views up and down the coastline of South Florida. As one moves west in the apartment through more intimate and smaller spaces, the colors of the terrazzo flooring graduate from cool white to deeper warm tones. Furnishings fill more of the spaces in the western rooms, making for a enveloping domestic experience in the guest rooms and family room. Spaces bear the colors, textures and patterns from exotic travel destinations. 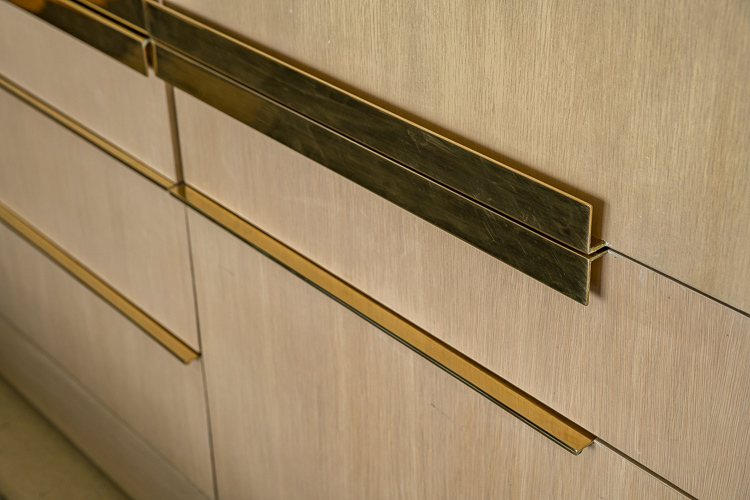 The closets and bunk beds in the guest rooms are decedents of ocean-liner era “steamer trunks”, with polished brass, velvet and suede details. Woven into the design agenda is the work of three artists who contributed site specific installations. Aaron Fein's embroidered ”Milky Way" runs the sixty-plus feet of the East Room, proving the only interior wall surface in this substantial space. The piece is subtle throughout the day as the ton-sur-ton white stitching, occasionally interrupted by soft pastel colors shifts quietly with the light. 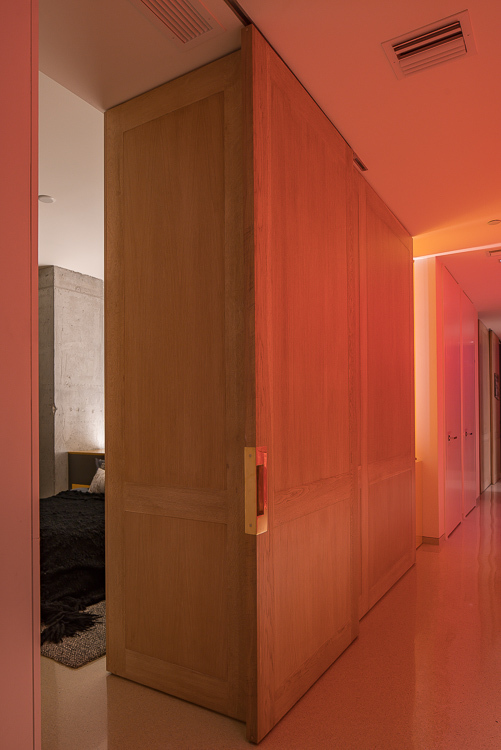 As the sun sets, the piece explodes in response to carefully tuned colored lighting, becoming the focus of the room. G2J developed a lighting configuration that very slowly cycles through shaded white tones of light to highlight various facets of the embroidery and to pop the pastels off of their canvas. 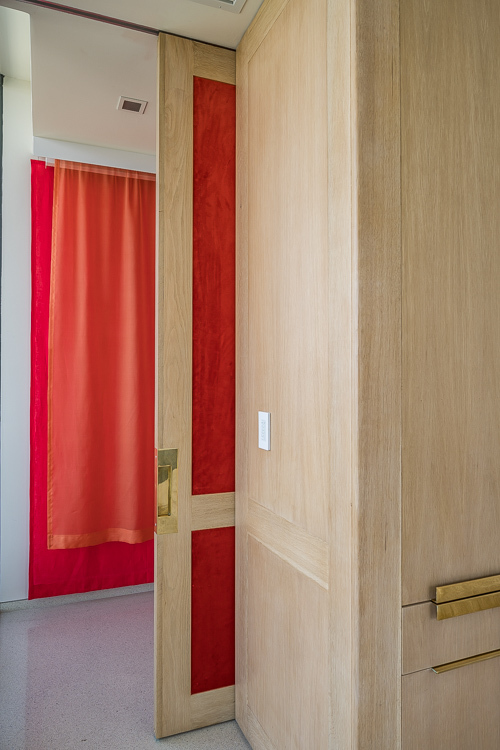 Along the hallway outside the west-side guest rooms, artist Leah Patgorski's piece "Dhobi Ghat" or "Clothes Lines" adorns the full length of the hall with movable silk and linen panels that become an enormous light fixture. G2J lit the piece above and between the two layers of fabrics so that the translucent silks reverberate against the orange and red tones of light bounced off the opaque back panels. 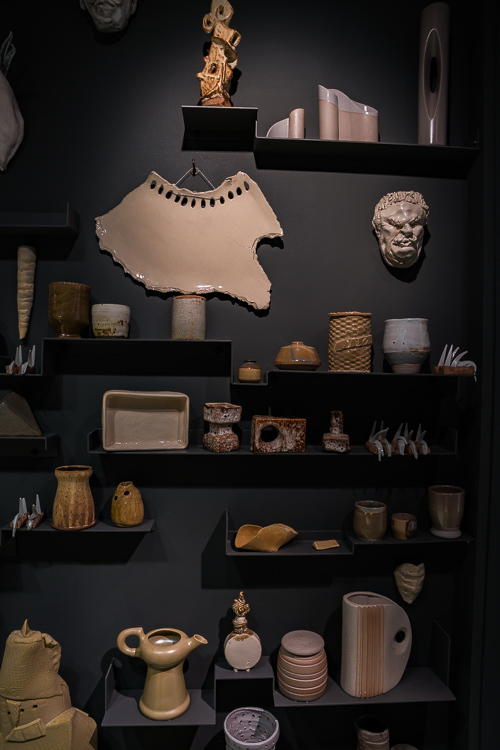 Cristina Hernandez Villalon's "Ceramic Gradients 01" is located at the the elevator entry hall. 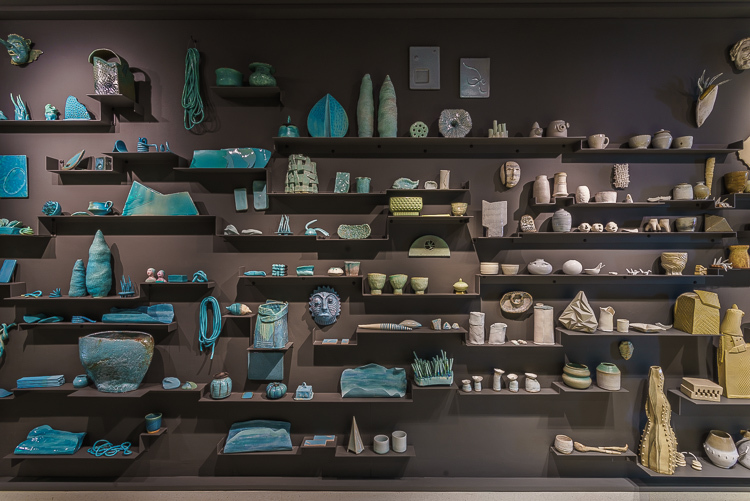 The piece is made up of over four hundred pieces of ceramic, one hundred and twenty of them made by Hernandez Villalon, curated to follow the gradient from the dark blues of the deep ocean to the lighter teals and greens, to the white of the waves crashing on shore and onto the sand tones of the beach. Lit so a changing group of pieces are spot lighted throughout the day, the piece reveals a different “face” to those arriving each time they visit. Co-authors of this project are Mauricio del Valle of MVDV Inc in Miami and G2J Design (Lighting) of Miami and New York. Jeannette Rivera, Andres Gomez, Julio Olvera and Carl Burzenski of Brickell Group Construction brought their depth of building expertise to execute this complex project. Notable subcontractors include Wilfredo Agurto of Imagination Design Group, Advanced Millwork of Orlando and Creative Terrazzo Systems of Fort Lauderdale. Furnishings and furniture consultation was provided by Mighael Halabu and Christina Suarez of Luminaire, Miami and Chicago. Custom upholstery and curtains by Jose Luis Villoni of Itallica Fabric Designs. Anisa Garnett, Coque Prieto and Manuosh created custom blankets.